Browse: Home / 2016 / September / 07 / Two World Title Fights at Santander Arena in Reading, PA, Friday! Two World Title fights headline Friday night at the Santander Arena in Reading, PA! King’s Promotions bring’s big time boxing to Reading on SPIKE TV with co-features starting at 9pm. Jacobs-Mora II and Easter and Commey for vacant title should be nothing but fireworks! Danny “Miracle Man” Jacobs, 31-1 (28), of Brooklyn, NY, defends his WBA World middleweight title against former WBC super welterweight champion and No. 15 contender Sergio “The Latin Snake” Mora, 28-4-2 (9), of L.A. in a rematch from August of 2015. In December Jacobs scored a sensational knockout over former WBO champion Peter Quillin in the first round. Mora has not fought since August. Several weeks ago on a conference phone call Jacobs said “If he’s saying I didn’t knock him down that caused him to twist his ankle I felt the contact it in my hand,” said Jacobs. “He grazed the back of my head but my ankle was already twisted,” said Mora. Both boxers are managed by Al Haymon. The call ended with “Go F yourself. I’ll see you in two weeks old boy,” said Mora. “Well let’s do it on September the 9th. You already know Sergio I’m coming for you brother,” said Jacobs. There is obvious bad blood between the two since their first fight which should make for a very interesting contest. In the other co-feature 2012 Olympic alternate Robert Easter, Jr., 17-0 (14), of Toledo, OH, and Richard Commey, 24-0 (22), of Accra, GH, fight it out for the vacant IBF Super lightweight title. “Yeah I am very excited coming to Reading and fight for the IBF title. I hope Richard Commey is bringing his A game because I will be bringing mine,” said Easter. “I’ve worked very hard to get this opportunity as I’m sure Robert Easter, Jr. has too so it should be a great fight,” said Commey. Commey is No. 3 and Easter No. 4 with both the No. 1 and No. 2 vacant. There are a dozen bouts on the undercard at this point but several will fall out or the Boxing Director Greg Sirb will see to it you don’t have much more than 7 bouts. In 8 round bouts former IBF welterweight and interim WBC champion Kermit “El Asesino” Cintron, 37-5-2 (28) of Reading continues his comeback. Local favorite super featherweight Frankie De Alba is in an 8. Another local favorite super Heavyweight Travis “My Time” Kauffman, 30-1 (22), of Reading is in a 10. 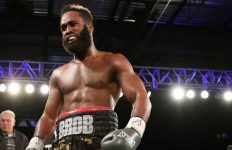 In a pair of 8 round bouts from Philadelphia crowd pleaser super middleweight Christopher “Ice Cold” Brooker, 10-1 (5) steps up to meet Elvin Ayala, 28-7-1 (12), of New Haven, CT. Light heavyweight Earl Newman, 9-0 (7), of Brooklyn will meet Leo Hall, 8-1 (7), of Detroit. Also scheduled yet without an opponent is Argentina’s Jorge Sebastian Heiland, 27-4-2 (14), who is the No. 1 WBC middleweight contender. 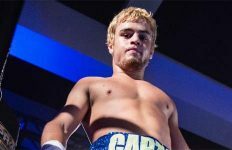 Super welterweight Erik Spring 7-1-1 (1), super welterweight Miguel Martinez, 2-2 (0), and super lightweight Kashon Hutchinson, 1-0 (1) all of Reading are in 6 round bouts. 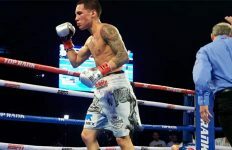 Also, from Philadelphia, the popular super featherweight Thomas “T.J.” Velasquez, 5-0 (4) out of the Danny “Swift” Garcia camp is in a 4 round bout. He is still without an opponent.